The distinctive odor of burning kerosene was heavy in the air as the faint light of the lantern flickered gently, the luminance just enough to peruse a book I had packed in my backpack for my trip. As I read all manner of fantastically odd African bugs landed on the pages for a frolic in the light. The lantern was about the only light by my tent that night, apart from a nearby campfire and the ever so small crescent of moon above. I was camped far away from the chaos of civilization and the industrial word, my abode now a small tent in Southwest Kenya in the Masai Mara, the natural extension of Tanzania’s Serengeti across the Mara River into Kenya. I had traveled 7 long hours from Nairobi in a dodgy minibus across ruff and tumble dirt roads with potholes seemingly the size of small autocratic African republics. Just days earlier I had been staying in the UK carousing the pubs of central London with old classmates from my University of London days. I stayed with a friend in East London with its endless rows of aging Victorian houses, a far cry from the African bush. London was well, London. There is a certain charm to London to be sure, Admiral Nelson stoically perched high above the pigeons in Trafalgar square staring squarely toward the gothic spires of Westminster Abby and Parliament looming drearily under an overcast sky along the banks of the murky Thames. Covent garden sits not far away with charismatic street performers captivating impromptu audiences and string quartets performing Mozart and Hayden chamber music in front of small wine bars. It was just before Christmas in London and not so telltales signs that the season was near were evident by the Christmas lights stretched high above Regent Street and masses of shoppers ducking in and out of the cold into the endless department stores and boutiques along Oxford Street. The flight from London to Nairobi was 8 hours long and landed at 11 PM. I landed in Nairobi with nothing in the way of concrete plans, just the general idea of a arranging a safari and finding accommodation. Eventually I ended up finding a hostel around 2 AM and sorted out a safari trip to the Masia Mara. I was excited albeit somewhat apprehensive about Nairobi as the lonely planet guide book was less than generous in its choice of words used to describe the Kenyan Capital. It dubbed Nairobi as the “new Johannesburg” replacing the South African town as “one of the most dangerous cities in Africa”. I attributed those lines to lonely planet’s occasional penchant for over dramatization and poetic license but a local taxi driver I later met told me to lock the doors right off, even as a local he had been mugged 3 times in the past year and as we drove he pointed out different groups of thugs prowling the streets for prey. I did not spend a lot of time after dark traipsing the back alleys of Nairobi needless to say but the place was enjoyable enough. Swahili is the main language although the Queen’s English was also widely spoken there. During the day it was an interesting place, bustling with people and commerce and chalked full of myriad colonial era buildings. Nairobi’s a rather peculiar place, every small store in downtown was manned by an armed guard including an ice cream shop. Downtown’s street corners are lined with merchants hawking lottery tickets and entrepreneurs pop up here and there with Nairobi style payphones comprised of tattered office phones attached to long cords on wooden tables along the sidewalks. Despite Nairobi’s shortcomings in terms of crime Kenya actually has a fairly stable political history unlike its bordering neighbors Sudan, Somalia, Ethiopia, Uganda, and Tanzania and once out you travel out of Nairobi Kenya is relatively safe place. Eventually it was time to leave for my safari I had sorted out to the Masai Mara. The main road leaving the city winds past shanty slums like Kibera, the streets lined with trash and endless rows of tin roofed shacks where rampant poverty begets rampant crime. A few hours away the road eventually comes to an escarpment overlooking an expansive plain below know as the rift valley. The view from above of the parched desert wasteland is nothing short of surreal. The road then descends down into the rift valley. The dirt road stretches on and on, along the way Masia tribes people herd animals and large acacia trees sprout from the dry cracked earth somehow eking out an existence in the desiccated soil. The shear vastness of the Masai Mara is best appreciated sitting atop a safari van with the wind blowing through your hair as the scenic vistas float by. 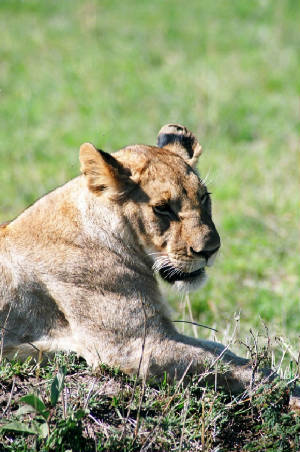 The Masai Mara is 1,500 square kilometers of protected safari habit and home of the peoples of the Masai tribe. The sights are spectacular and at times appear unreal. The dirt paths are endless and swoop past a diverse landscape of endless savannas, rocky cliffs, rolling grassy prairies, long rivers, and still ponds. The wildlife of the Mara as its colloquially known is abundant and endless. Prides of lions sit lurking just beyond the sight of large buffalo herds, stalking their prey and ready to pounce in between the long hours they spend napping. Thousands of striking termite mounds more than four feet tall litter other parts of the plain . At one point we came to the Tanzania border where the Serengeti meets the Masia Mara. The Mara river is beautiful and majestic. It is here that the annual wildebeest migration takes place every October when literally millions of the bizarre ungainly beasts jump headlong off the rocky embankments and frantically attempt to cross the river from Tanzania into Kenya. In December however, the ripples of the surface are relatively calm and full of bloated hippos bathing lazily in the cool waters. The meandering river reflects the deep blue sky as crocodiles crawl beneath large green palms sprouting along its fertile banks. Elsewhere in the Mara giant elephants amble on the plain lumbering past the occasional solitary acacia tree. Lanky giraffes walk awkwardly amongst herds of thousands of gazelles, topi, impalas, onyxes, buffalo, and zebras. Warthogs dart about and hyenas piddle in the mud as vultures swoop high above. Jackals scurry about waiting to compete with the other scavengers for leftover carcasses. To observe tribal life in the bush is to realize how far away from this world one truly lives. I walked about a mile from my tent and visited a Masai tribal village. The place was fantastically primitive. There were perhaps 30 circular huts made from cow dung with thatched roofs, no electricity or running water. In the middle of the small village was a corral for keeping the cows and other livestock safe from predators at night. Every morning the towns youth would shepherd the livestock to the surrounding hills setting off at 4 AM and return to the village just before dusk. A young villager took me around the village and communicated in the broken English he had picked up from the occasion safari types that wandered near his village. We entered one of the homes, inside it was dark its walls blackened with soot from the small fireplace in the corner. There was one large room inside the small hut and a young child played with several goats huddled in a corner inside. 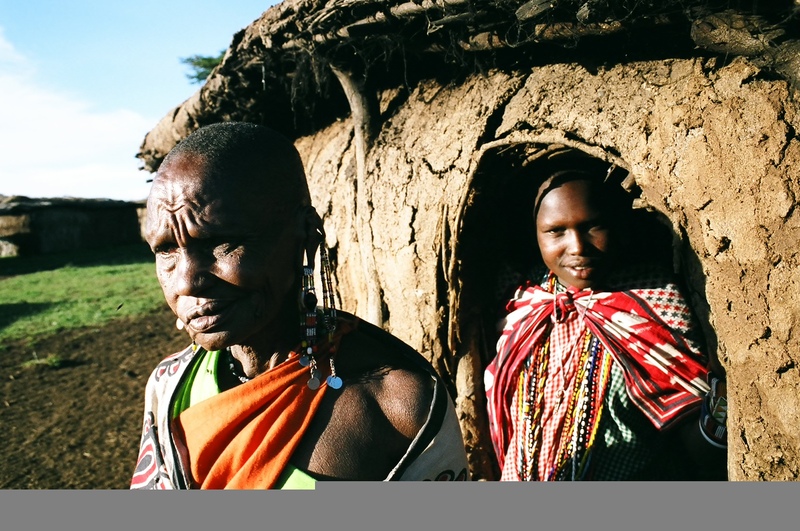 The Masai are an exotic people with tribal scars on their faces and long dangling earlobes. The men wear bright cloaks of red and blue and survey their land with large shepherd sticks in hand. The whole village was splendidly photogenic and as I snapped picture after picture I felt like I was on another planet, no doubt they must have thought the same of me. Namanga on the Kenyan side and I walked a few hundred yards to the Tanzanian side. The visa line at immigration was chaotic to say the least as locals pushed and shouted their way though the queue. Hulking lorries sat like idle dinosaurs between the massive gates separating Kenya from Tanzania. Once finally over on the Tanzanian side the fun began. At one point the road was washed away by heavy rains and mud and the entire bus went off-roading as local tribal kids gleefully directed the bus through the grass and mud. We passed another bus stuck in the mud with all its passengers foot deep in mud trying the free the stranded vehicle. Eventually the roads cleared and the bus continued the long trip south. Somewhere along the way just to the east was Mount Kilimanjaro obscured by clouds and rain. I wondered what Africa was like in the 1930’s when Hemmingway was there writing The Snows of Kilimanjaro. At length the bus eventually got to a small provincial town called Arusha where I later arranged a safari to Tanzania’s Ngorongoro crater. The roar of a landrover is loud and distinctive not unlike that of the lion’s roar though whose rolling savannas it trespasses. The landrover would be my vessel in Tanzania in search of big game and lesser animals. 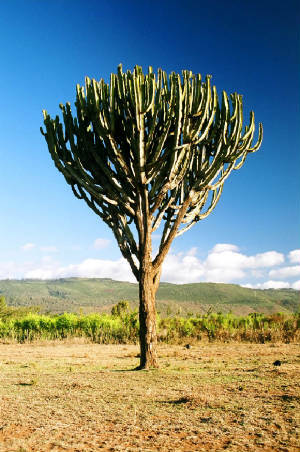 I had left a small town called Mtowambu with three German medical students I met along way. 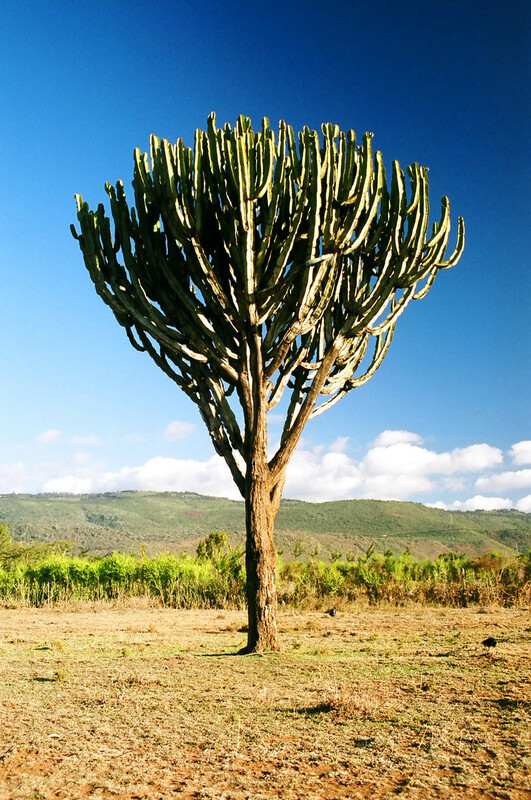 Mtowambu is a sleepy town whose name literally translates to “mosquito river”. I did not see a river while I was there but I did see plenty of mosquitoes. The hungry little bastards have an uncanny ability to somehow magically slip though the tiniest of holes in the fine mesh of any mosquito net. Eventually with the landrover loaded with backpacks and 10 liters of water we left Mtowambu and headed for a safari to the Ngorongoro crater. 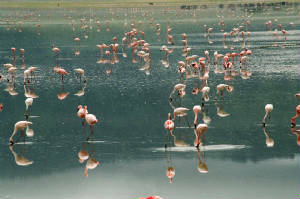 The Ngorongoro crater is an amazing microcosm of life. Two million years ago the cone of a giant volcano collapsed on itself creating a giant caldron-like bowl surrounded by a 2000 foot high rim all the way around. In the middle of the bowl is a savanna 100 square miles in area and an amazing soda lake. Like the Masai Mara the crater is full of diverse life, lions, wildebeests, rhinos, cheetahs, impalas, gazelles, elephants, hyenas, ostriches, and zebras to name just a few. In the middle of the caldera sits a soda lake which from afar has a distinctive pink hue. 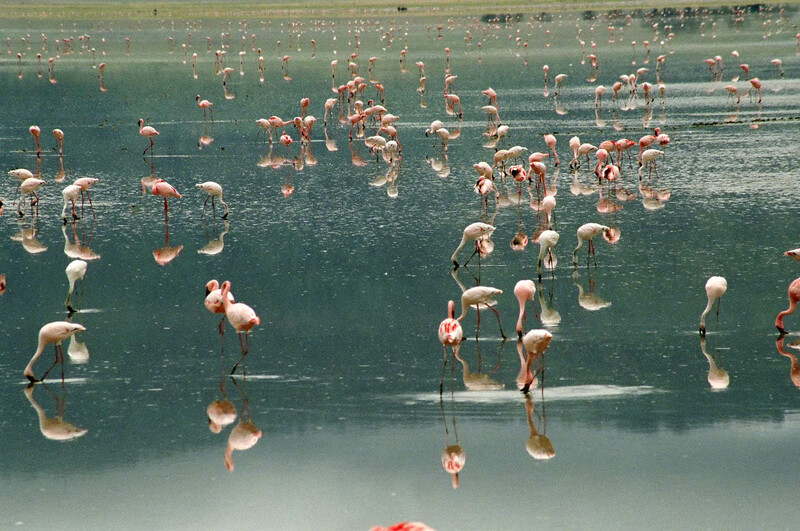 Upon getting closer a sea of thousands of pink flamingos frolicking in the shallow waters becomes visible. Along one of the banks of the lake limbs of dead trees gently sway in the breeze the scenery is utterly amazing and world all its own.